Amberlea is our number one doe in the barn. She has been Emilie's showmanship doe for 10 years. 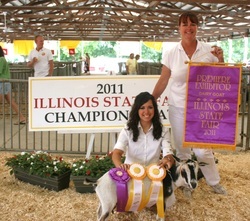 Amberlea won Senior Grand Champion at the 2011Illinois State Fair and best udder on her 8th birthday. What a way to celebrate. Her daughter “Rue” took Jr Grand Champion the same day. Amberlea has a great udder attachment even at 9 years old and has width and elegance. IT'S Official!!!! AMBERLEA EARNED HER LAST LEG AT THE HOOSIER CLASSIC ON 8/26/12 AT THE AGE OF 9. SHE is NOW A PGCH IN NDGA!!!! WE ARE SO PROUD OF OUR OLD GIRL AND OF COURSE EMILIE TOO. Amberlea ALSO WON BEST UDDER.